Jagruti's Cooking Odyssey: Eat Nutritious, Feel Fabulous - Challenges that we all should take ! Eat Nutritious, Feel Fabulous - Challenges that we all should take ! What is the real meaning of healthy? These days this word is constantly thrown around without truly understanding it's real value. With so many claiming to be eating healthy, there is still a massive increase in the general public developing all sorts of health related illnesses. The only way to combat all of these illnesses is to eat well and to do plenty of exercise. There are so many nutritious foods out there that can increase our wellbeing and health. wholegrain, proteins and essential amino acids, good fats and fruits and vegetables! It's about eating all of these in moderation. If we can incorporate more of these foods into our diet, then our overall health is sure to improve! Obviously, simply adding a piece of fruit to your calorie loaded dessert doesn't suddenly make your dish healthy. Adding heaps of sugar to your nutritious porridge is completely against the point! A bit of vegetable puree to fried food won't magically make it beneficial. It has been scientifically proven that eating certain foods together cancels their nutritional value. For example foods with calcium will prevent any iron being absorbed in the body, so eating these together in the same meal isn't going to help! I want to search for recipes that actually are healthy and full of nutrients. That use all of the true ingredients out there, that have medicinal benefits to the body. I want all of you to come up with recipes that do have health benefits, where every ingredient in the recipe can provide the body with a different nutrient. This recipe could be one that's been passed down the family, or your own creation! The focus is on low GI and low fat! I was thinking over the past few months to start this challenge, one day our fellow food blogger Nivedita of Nivedita's Kitchen mentioned the same and then we both decided to go ahead with this project. So why wait any longer, it's new year, let's make a new start ! 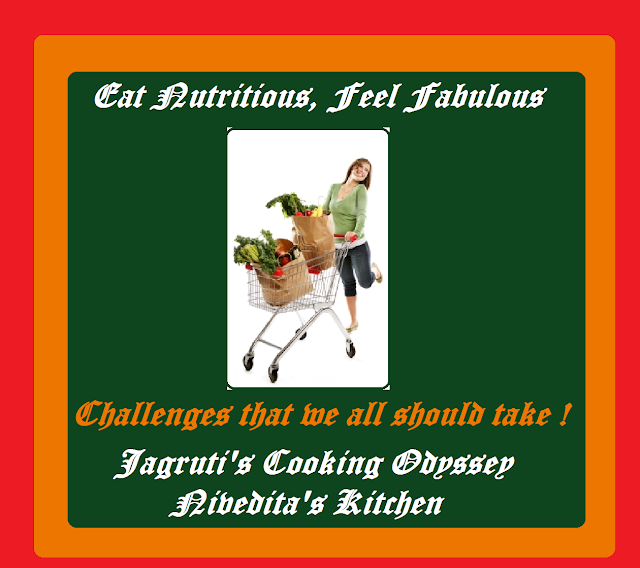 Let's cook with nutritious food in right manner and share with the world out there. If you are thinking same as me and Nivedita, join us and let us know if you want to be a part of this challenge. So let's Eat nutritious and feel Fabulous ! Prepare dishes with Wholegrain, Vegetables, Fruit, Legumes,Seeds, Nuts, Natural sweeteners or low fat dairy or Non-dairy products without loosing their vitamins and minerals. These type of dishes won't be allowed e.g. Cake baked with little fruit or Baked samosa made with AP flour as there is no nutrition in AP flour so no point to either bake or fry. Do you know what I mean ? Recipe which are allowed only contains ONLY 1 tsp. fat or sugar per serving. Only Vegetarian dishes will be allowed. Can cook Breakfasts, lunch, Dinners, Snacks or drinks. Me and Nivedita will be hosting this challenge over alternative months. We all will post our recipes on 20th of every month. Use of logo and link of this announcement page is MUST.